January is the perfect time of year to celebrate fresh beginnings, resolutions, crisp winter weather and for some, Birthdays! So if you enjoy a January birth date then the beautiful Garnet is your lucky, precious birthstone. The word Garnet originates from the Latin “Garanatus,” which translates as “seedlike” in reference to the pomegranate fruit. A popular misconception about the glorious Garnet relates to the rich red colour of this stone. 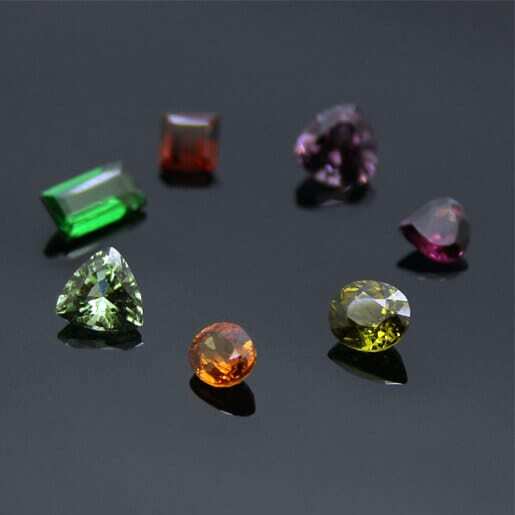 What is less commonly known is that Garnets are naturally formed and available to buy or source in a veritable rainbow of colours from bright purples to a huge array of zesty citrus tones ranging from yellows, oranges and an array of green tones. Garnet gemstones come in all shapes, sizes and even colours! Learn more about January’s Birthstone in our new blog. Pictured above is a sample selection from Julian Stephen’s collection of precious Garnet stones, each lovely example highlights the huge variety and range of gemstones available to purchase and ready to be turned into an extra special bespoke piece of jewellery! Julian Stephens specialises in sourcing rare, unusual precious stones which are then hand-set by Julian from our on-site workshop and studio area. Garnet gemstone jewellery by Julian Stephens, featuring the birthstone for January Julian has created a wealth of handcrafted modern jewellery featuring Garnet gems. In keeping with our January theme this month’s focus is on the Garnet birthstone, which can be showcased in an array of precious metals of your choosing from Sterling Silver, Rose Gold, Yellow or White Gold and of course Platinum. At Julian Stephens we can offer a truly tempting array of Garnet stones in a dazzling selection of colours, sizes, shapes and styles to suit your taste and preferences. Anything is possible! From traditional jewellery to fresh and modern statement pieces, each and every piece is made by hand and on-site by our resident Silver and Goldsmith. 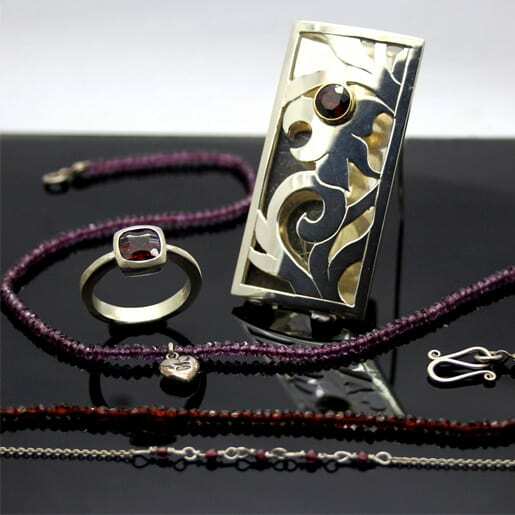 You can buy hand-crafted, ready made Garnet jewellery like the pictured examples above which include stunning handmade rings, a spectacular hand-pierced Garnet brooch and a chic, contemporary Garnet beaded Rose Gold Heart necklace. Happily all of the pictured items can be bought direct from our website and posted directly to you, free of charge. Alternatively you can get in touch via phone or email to discuss prices and time-frames for that very special, personal bespoke or commission item.